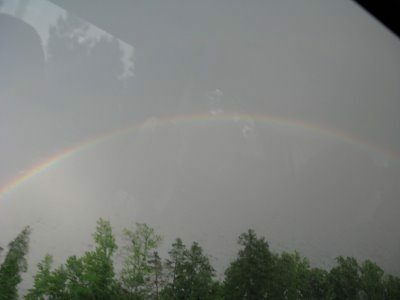 While traveling this summer, we witnessed the most beautiful double rainbow that stretched from one side of the road to the other. We tried to take pictures from every angle, but never could truly capture the beauty that was hanging over us. We even saw a couple of cars pulled off on the side of the road, trying to get an even better photo. Nick had fun shooting picture after picture of this message from God. 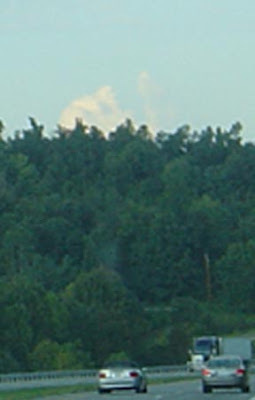 Above is one photo he took. Rainbows speak to people whether they are Christians or not. You just can’t see one and not think of God and His Promises. I wonder how Noah felt every time he saw a rainbow after surviving the flood and then enduring a heavy rain. He had to feel great relief that once again he wasn’t required to load up a huge boat with every kind of animal and then set sail for over a month with no land in sight. I long for such a personal promise….some kind of sign that what my family is enduring now is only temporary. And I long for a miracle for my sweet Nick. We had such a good day yesterday….he even got in the pool for a little while. We played a board game and laughed and laughed, and then we built a campfire and Nick came out and sat in a lawn chair and was in such a good mood! It was just like the old days! But when bedtime came and I watched Nick struggle to stand up and get his balance to walk upstairs to his room, I was flooded with the reality of his illness. I wonder if Noah was ever flooded with reality after landing the ark and realizing that his family was “on their own” to start a new earth. I am sure they had friends whom they loved that were not worthy of the ark. I am sure they had fears of where to begin in their new venture. That rainbow had to make him smile everytime he saw it! Last night, I cried myself to sleep. My heart aches beyond anything I have ever felt. Tonight we are driving back to Cincinnati. In the morning, Nick has a physical at 8:30, a petscan at 10:30, and then Lord willing, his first treatment in the afternoon. Like Noah facing a new world, I am trying to face each day looking up. I have to believe that Noah looked up a lot. Looking for guidance, looking for signs, looking for God’s presence, looking for strength. God knew Noah would be looking up. I think that’s why He chose to give him the gift of the rainbow. I am thankful that Noah’s gift continues to bless us today. God is a God of miracles. I will not stop believing that God is still in the miracle business! Please pray for a miracle for Nick. 1 But now, this is what the LORD says- he who created you, O Jacob, he who formed you, O Israel: “Fear not, for I have redeemed you; I have summoned you by name; you are mine. 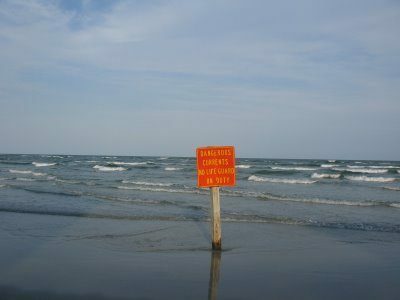 As I walked past this section of the beach where the ocean waves entered the inlet from several different directions, I could feel my legs weakening at the thought of one of my children being swept into these dangerous currents. The lifeguard further down the beach front explained to me that the current in this area is much like a washing machine, churning and spiraling inward pulling everything down that enters its unpredictable waves. “Do not go near this section,” I warned my boys daily. Knowing the danger and seeing the warning signs, we easily made the choice to stay far, far away. Yesterday’s news with Nick has awakened me once again in the wee hours of the morning with that feeling of panic and dread that can only be subsided by time in God’s Word. Upstairs Nick sleeps peacefully with my mom, his future uncertain. The bone scan showed some things that they are unsure about. The reality of the tumors in his brain causes my chest to cave in. Thursday we return again to Cincinnati (a two-hour journey) for a petscan to look at all of the tissue of Nick’s body. I still pray for a miracle. I think of Daniel’s 21-day fast, and I contemplate it…..desperate for any way to show God that I am sold out on His love and provision for Nick, trusting only in Him for healing. 19 The Sovereign LORD is my strength; he makes my feet like the feet of a deer, he enables me to go on the heights. So, tonight, as I lay here in the darkness of my living room, hearing only the repetitive breaths of my sweet doggie at my feet, I must make a choice. A choice to either fear or to trust. A choice to wait upon the Lord or become paralyzed by anxiety. A choice to keep walking in faith or be overcome with doubt. Here is what I know: God’s Word is true. God knew Nick before he was formed. God loves Nick. God will not abandon or forsake Nick. God has a plan for Nick. God brings good out of every bad situation. God’s promises never fail. God never fails. God’s mercy is new every morning. Thank you, Father, for being the Great I Am, the Alpha and the Omega, the Creator of Heaven and Earth. Who better to care for my son? In Your loving arms I place Nick’s future. I continue to ask for and believe that You are a God of miracles and that if Your will can be fulfilled by healing Nick than You have the power to do so. I also, fraily and humbly, realize that Your ways are higher than My Ways. So, God, as my family passes through these waters, my deepest prayer is that You will continue to pass through with us. Are you in water over your head right now? Please know that I am praying for you too. 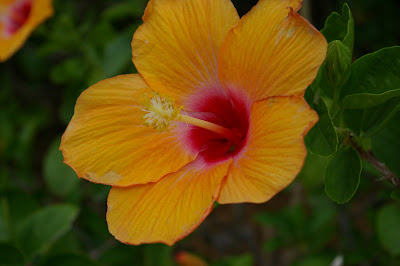 Thank you to everyone who visited my blog and left prayers and kind words. Thank you to everyone who is continuing to lift Nick to His Heavenly Father. I am overwhelmed with thanksgiving. 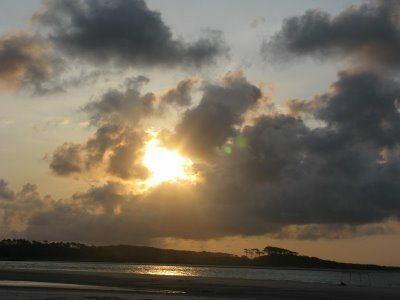 It was our last morning at the beach just a few weeks ago, and I had never gotten up early enough to watch the sunrise. So I decided that this particular morning I would get up early and head to the inlet over which the sun had come up faithfully every morning. My friend’s pictures of the sunrise from the day before we amazing, and I just knew I had to see it firsthand. Of course, as God would have it, the sky was filled with clouds. 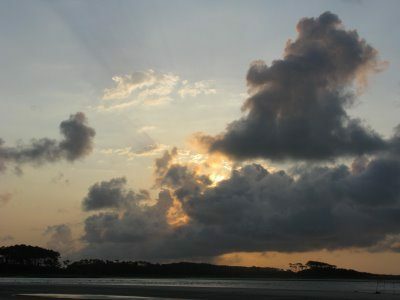 Dark, thick clouds covered the entire inlet corner from where I knew the sun would be rising! As I sat there, I couldn’t help but think that this was not an accident. God wanted me there on this morning and this morning alone, because He had something to say to me that was very personal. So, I sat and watched the clouds. I watched and watched wondering if eventually the sun would be up overhead and I would never even know when it popped over the trees in front of it. And then it happened! Small pieces of orange and yellow started to appear from within the clouds. I was witnessing the sunrise in spite of the dark clouds! Many people stood around on the beach looking up at this site, and I felt that many might be disappointed that they were up early and not seeing the magnificent sunrise of an uncloudy day. My heart was pounding as I wanted to scream across the bay, “This sunrise is for me! God is reminding me that His Son still shines on my cloudy days!” Don’t be disappointed. Be thankful! We have a faithful sun that rises in spite of the weather, and we have a Faithful Son that rose to get us through all types of weather! Oh, it was a great morning for me! I will forever be thankful for this treasured sunrise. Oh, God speaks. He speaks through cloudy sunrises. He speaks through solitary shovels. If we are seeking, we will find treasures! Treasures from God. As I sit here in the wee hours of the morning praying earnestly for Nick’s health, I am seeking peace. I am seeking God’s healing power of my son’s body. I know that God has treasures in store. Tonight I am seeking God’s right hand to uphold me. I know He will be faithful. Clinging to the Thumbs Up!! If you have never been to Nick’s website and scrolled down through his story, you may not know that in 2006 we began taking pictures of friends and family with their thumbs up after Nick’s successful surgery. 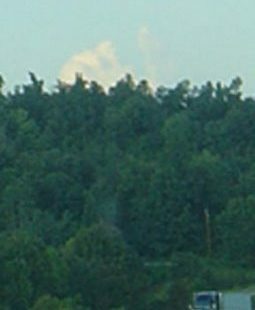 About four weeks later, my mom was driving on the interstate to our house for Nick’s radiation treatments to begin and saw this cloud above the trees. She saw the entire hand but by the time she searched her purse for her camera while driving at full speed, she was only able to get the top half. I told her the whole promise of God’s presence was meant to be seen by “her eyes only,” but I am so glad we were all able to see a portion of it! 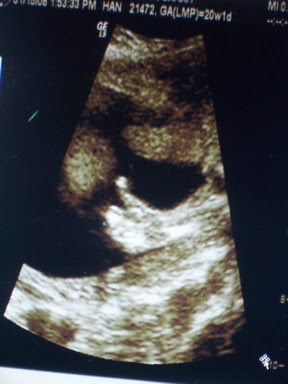 This past winter a week before Nick’s MRI that showed yet another tumor, a dear friend of mine just happened to be with me in Columbus when her daughter called from Illinois to share about the ultrasound picture of her baby-a perfect thumbs up! She had no idea I was with her mom at the time! Many other miraculous things have happened with a thumbs up and with other symbols of God’s presence in our lives. I cling to these as we await a critical day for Nick tomorrow. He has a bone scan at 8:15 a.m. in Cincinnati. The results of this test are extremely critical to Nick’s prognosis. As we wait, we trust God for strength, hope, patience, peace, love, mercy, grace, and protection. Thank you for praying for Nick with us. I awoke this morning at 5 a.m. and felt that very familiar feeling of dread and panic that has been waking me up quite often lately. The verses above are a couple I memorized during one of Nick’s MRIs a year or so ago, and I turn to it often when I am feeling “shaken” by life’s events. As we finally drove to Cincinnati early this morning for Nick’s appointment, I found myself falling in and out of sleep and when I would wake up I would whisper prayers…..prayers for hope and for strength. It was good to see mom smiling through the window of the unfamiliar hospital. There’s nothing like a familiar, smiling, loving face to make a lot of fears wash away. Where would I be today without my mom? As we rode the elevator to a new hematology/oncology floor, it almost felt surreal. Nothing looked the same as Columbus. No recognizable nurses, doctors, security guards, receptionists…..we were strangers—visitors. Sitting in the waiting room, I still felt out of place and sad. Was this really Nick’s lot in life? Why? Why? Why? But then I could hear the whisper, “Why not?” After all, the rain falls on the just and the unjust…who am I to feel the right to be spared what any other parent in the room was facing as their hearts looked just as sad as mine? When they said, “Nicholas,” and we followed our nurse to the place where Nick would be weighed and measured, once again I had this feeling that we did not belong here. But as we ventured through the maze of hallways, she appeared very friendly, and by the time we arrived at Nick’s room, we were all smiling and even laughing a bit. She told us that Nick was already quite popular there and that he had already been spotted in the lobby by someone who was expecting them. She then said that they may have to move us to a bigger room, because so many people wanted to meet Nick. Sure enough, they moved us to a bigger room and brought in four more chairs! Nick didn’t know what to think. We had to revisit Nick’s past by starting from the very beginning of Nick’s journey with cancer and telling in detail his life over the past 6 years. It was tough recollecting all of those memories and not breaking down at the reality of what Nick has lived, but we made it through. When Dr. Falaudi entered the room after our time with a nurse practitioner, she immediately hugged us all and was glad to meet us. She was precious. After two hours of consulting with us, the team from Cincinnati joined hands with me, mom, Tim, and Nick and we prayed together. Then we took a few pictures (of course), and we left to go eat. While having a late lunch, Mom, Tim, Nick, and I all took turns sharing what we thought about the decisions that had been placed before us. We felt peace with one of the choices and decided to go back to the hospital and go ahead with the signing of the papers in order to speed up the process of beginning Nick’s treatments. The tough part was knowing that we would now be traveling to Cincinnati instead of Columbus for Nick’s medical needs. We are all struggling with that. Nick even said on the way home, “I sold my soul to Cincinnati.” He was having a hard time thinking about not seeing all of the nurses and doctors that he has grown to love over the past 6 years……so was I.
I want to take Nick to Columbus soon to visit everyone. I think that will be good for all of us. Basically, Nick will begin a treatment that consists of an IV every three weeks. I cannot remember the name of the medicine, but we felt this was best option for Nick in order to prevent him from needing a picc line and in order to keep his “quality of life” at a level that is not depressing. We will reevaluate in about 6 weeks after we see if this new treatment is stabilizig and/or shrinking the cancer. Like a flower that grows in an unexpected place and yet blooms beautifully, we want to take this time in Cincinnati and “bloom” into whatever it is that God wants us to be while we are there. I told Nick we will soon know nurses and doctors names. We will become familiar with hallways. We will bloom petal by petal. As for our dear doctors and nurses in Columbus, WE LOVE YOU SO MUCH!!!!!!!!!!!!!! We will miss you with every inch of our heart, but we will stay in touch. Please keep praying for Nick! He has a long road ahead of him. Tonight, my eyes are heavy. But I wanted to send this before I went to sleep. Please keep praying for Nick…..he is nervous….we definitely felt the prayers today! Thank you so much! I’ll write more soon. Psalm 33:21-22 21 In him our hearts rejoice, for we trust in his holy name. Ps. 92:12 The righteous will flourish like a palm tree….. 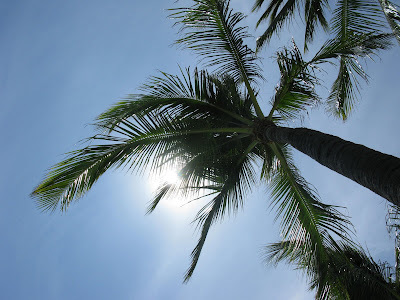 I looked up from my lawn chair one day in the Bahamas (on Nick’s Make A Wish Trip-believe me, the Bahamas wouldn’t normally be a vacation option for our family) and this was the view above my head! I just had to take a picture! It took my breath away! The palm branches so beautifully shading me, but at the same time, the sun was shining through the leaves so purposely. So as we leave early in the morning for Cincinnati Children’s Hospital for a very critical appointment for Nick with a new doctor, my prayer is that God will continue to use us to share His love with those we meet along the way and that He will receive all of the glory! Thank you for every prayer for Nick. Thank you. God bless you all! 1 O LORD,you have searched me and you know me. 2 You know when I sit and when I rise; you perceive my thoughts from afar. 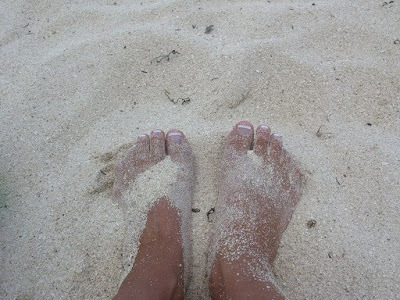 Tonight, I reflect on a moment during Nick’s Make A Wish trip when I took a picture of my feet in the sand. I was just taking random photos and never thought that I would come back to this picture as a reminder of the vastness of God’s thoughts! I am amazed more and more every day at just how powerful and loving and all-knowing God truly is!!!! Thank you for every prayer! at night I stretched out untiring hands and my soul refused to be comforted. 15 With your mighty arm you redeemed your people, the descendants of Jacob and Joseph. 18 Your thunder was heard in the whirlwind, your lightning lit up the world;the earth trembled and quaked. God knew that today was going to be hard for me…………….I am sure that is why He laid the words to “Praise The Lord” on my heart this morning in bed. I needed the words to that song to carry me through. When the nurse put me in a room that I have sat in so many times with Nick and I waited for Nick’s doctor, I couldn’t hold back the tears. When she came in, she held me forever while I cried and cried and cried and cried. We had a good visit. OH, I love her so much. Tonight you can feel the tension in our house. Everyone is so uptight. I feel like all of our kids are edgey, Tim and I are edgey, and nothing feels right. “Find rest, O my soul, in God alone…………….” That is my prayer. Tim and I were talking in bed this morning, and he told me he had been praying but his prayers kept running into something. My mind started hearing the phrase “up against a wall.” It brought back the memory of a song from my childhood that I could not remember very well. I could hear bits and pieces of the melody and a few words, so I told Tim what I was thinking and HE REMEMBERED THE SONG!!! We lay there and quietly said the words to the chorus together. I wanted to share the song with you. I hope it will help you like it is helping me. What else can I do today but praise the Lord?! He never fails. His mercy is new every morning. He will not abandon me. He will not forsake me. His promises are true. He is faithful and just. His ways are not to harm but to prosper. His ways are higher than my ways. He is the Good Shepherd, the Provider, the Comforter, the Protector. I have to praise Him. Thank you for every single prayer for our family. Thank you.